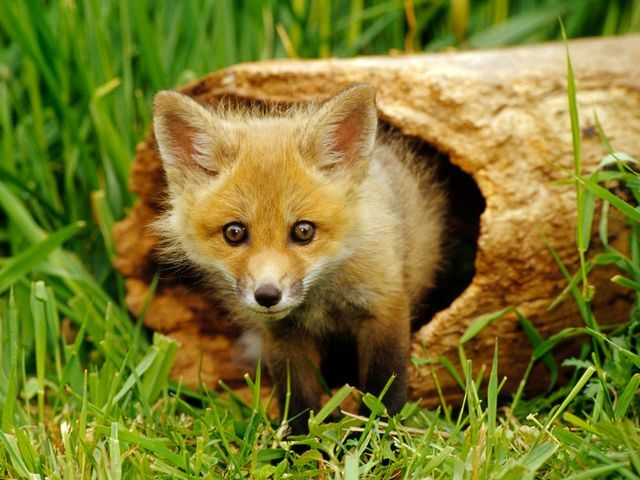 A wallpaper with a cute, fluffy baby of red fox, which curiously peeks from his hiding in an old wooden den. The red fox is a cousin to the dog and is widely distributed across the Northern Hemisphere, from the Arctic Circle to North Africa, Central America, in Asia and Australia. Red foxes are solitary nocturnal hunters, intelligent, cunning and secretive carnivores.